We have been spoiled. Since the introduction of the Xeon "Nehalem" 5500 (Xeon 5500, March 2009), Intel has been increasing the core counts of their Xeon CPUs by nearly 50% almost every 18 months. We went from four to six (Xeon 5600) on June 2010. 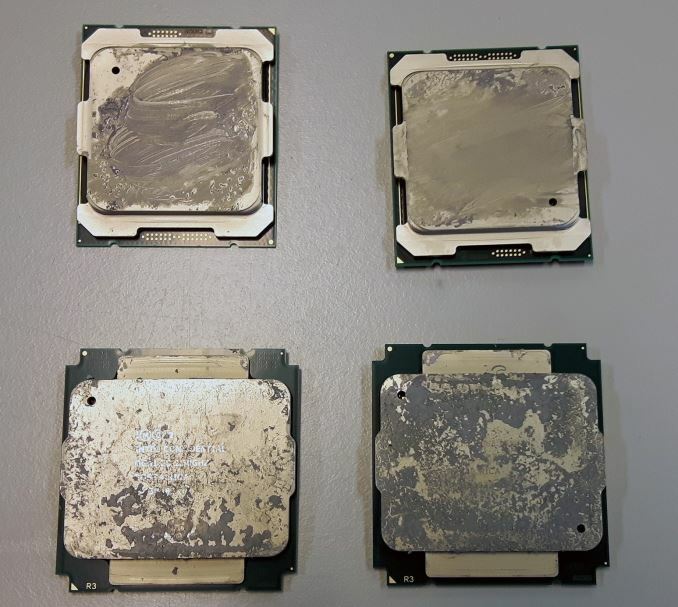 Sandy Bridge (Xeon E5-2600, March 2012) increased the core count to 8. That is only 33% more cores, but each core was substantially faster than the previous generation. Ivy Bridge EP (Xeon E5-2600 v2, launched September 2013) increased the core count from 8 to 12, the Haswell-EP (Xeon E5-2600 v3, sept 2014) surprised with an 18-core flagship SKU. However it could not go on forever. Sooner or later Intel would need to slow down a bit on adding cores, for both power and space reasons, and today Intel has finally pumped the brakes a bit. 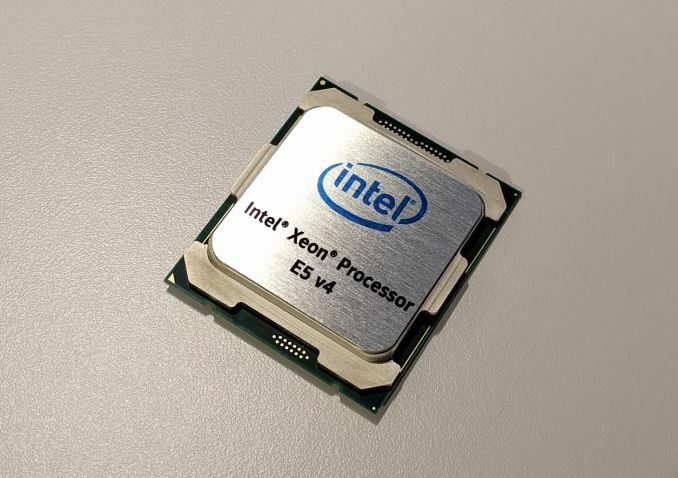 Launching today is the latest generation of Intel's Xeon E5 processors, the Xeon E5 v4 series.Fifteen months after Intel's Broadwell architecture and 14nm process first reached consumers, Broadwell has finally reached the multi-socket server space with Broadwell-EP. Like past EP cores, Broadwell-EP is the bigger, badder sibling of the consumer Broadwell parts, offering more cores, more memory bandwidth, more cache, and more server-focused features. And thanks to the jump from their 22nm process to their current-generation 14nm process, Intel gets to reap the benefits of a smaller, denser process. Getting back to our discussion of core counts then, even with the jump to 14nm, Intel has played it more conservatively with their core counts. Compared to the Xeon E5 v3 (Haswell-EP), Xeon E5 v4 (Broadwell-EP) makes a smaller jump, going from 18 cores to 24 cores, for an increase of 33%. Yet even then, for the new Xeon E5 v4 "only" 22 cores are activated, so we won't get to see everything Broadwell-EP is capable of right away. Meanwhile the highest (turbo) clockspeed is still 3.6 GHz, base clocks are reduced with one or two steps and the core improvements are very modest (+5%). Consequently, performance wise, this is probably the least spectacular product refresh we have seen in many years. But there are still enough paper specs that make the Broadwell version of the Xeon E5 attractive. It finds a home in the same LGA 2011-3 socket. Few people will in-place upgrade from Xeon E5 v3s to Xeon E5 v4s, but using the same platform means less costs for the server vendors, and more software maturity (drivers etc.) for the buyers. Broadwell also has several features that make it a more attractive processor for virtualized servers. Finer granular control over how applications share the uncore (caches and memory bandwidth) to avoid scenarios where low priority applications slow down high priority ones. Meanwhile quite a few improvements have been made to make the I/O intensive applications run smoother on top of a virtualized layer. Most businesses run their applications virtualized and virtualization is still the key ingredient of the fast growing cloud services (Amazon, Digital Ocean, Azure...), and more and more telecom operators are starting to virtualized their services, so these new features will definitely be put to good use. And of course, Intel made quite a few subtle - but worth talking about - tweaks to keep the HPC (mostly "simulation" and "scientific calculation software) crowd happy. But don't make the mistake to think that only virtualization and HPC are the only candidates for the new up-to-22-cores Xeons. The newest generation of data analytics frameworks have made enormous performance steps forward by widening the network and storage bandwidth bottlenecks. One example is Apache Spark, which can crunch through terabytes of data much more efficiently than its grandparent Hadoop by making better use of RAM. To get results out of a massive hump of text data, for example, you can use some of most advanced statistical and machine learning algorithms. Mix machine learning with data mining and you get an application that is incredibly CPU-hungry but does not need the latest and fastest NVMe-based SSDs to keep the CPU busy. Yes, we are proud to present our new benchmark based upon Apache Spark in this review. Combining analytics software with machine learning to get deeper insights is one of the most exciting trends in the enterprise world. And it is also one of the reason why even a 22-core Broadwell is still not fast enough.